Last year, the Monster Energy AMA Supercross Championship had three Triple Crown events. While there will be three Triple Crown events again this year, the format has changed. For this week’s 3 on 3, Steve Matthes, Jason Thomas, and Jason Weigandt discuss the 2019 Triple Crown format. Steve Matthes: I like it. Much better in my opinion. The first Triple Crown last year featured a way too short first main event. The start is important, but it shouldn't be that important. They changed it for round two in Atlanta, made the first event a bit longer and that's a good thing. But to have all three events the same length takes all the variables out of things. I love the format and I love that it gets tweaked to make it the best it can be. I was talking to Vince Friese and he indicated that he wasn't a fan of them changing it, but to me, it's a good thing. Three 12-minute events is actually one minute less than the Atlanta and Minneapolis rounds last year. I like it, it seems like the perfect amount of time to have a good race. Jason Thomas: First, I love the Triple Crown format. I would like to see more of these in the championship. As a spectator, there is so much more relevant racing action to take in compared to a normal format. The heat races are a yawner most of the time and the mid-pack guys are just trying to not crash and save it for the main event. With these three races, everything counts! We will see 36 minutes of 450SX racing, and every minute will have 100 percent intensity. That's a win for the fans every time. I do think the extra time is going to take a toll, though. I expect to see the strongest of the field rise to the top in the final race. Recovering quickly will be really important and finding a way to maintain focus three separate times is going to be a big ask. Jason Weigandt: Yeah, I think this is the best idea, overall. If every race counts exactly the same, every race should run for the exact same distance. I believe last year's staggered schedule was just a move to prevent saying the longest race of the night will only be 12 minutes, which sounds bad on paper, especially to traditionalists/keyboard warriors. But in reality, most races are decided within the first 12 minutes anyway (go and reference the three races you remember with amazing last-lap battles and I'll counter with literally 1000 that did not). As always, if you're not down with the Triple Crown, just imagine the Triple Crown was the regular supercross format, and then someone suggested a new format with heat races that count for nothing at the beginning of the night. We'd all think that idea made no sense at all. Steve Matthes: I think you have to look at the guys that are great starters and sprinters, right? But to me the big five (AC, Nichols, Ferrandis, McElrath, and Hampshire) are still the favorites whether it's a Triple Crown or not. But fine, I'll go with Jimmy D. He's a good starter, the races are shorter, which helps him and yeah, seems like Decotis could be a race sleeper. Jason Thomas: Tough question because I don't think we will see a surprise winner. I think the top guys are going to win all three races. With there being five capable winners, we would need a first turn crash or some anomaly to get a win from the rest of the field. I agree with Steve that Decotis is the most likely from what we saw in Glendale, but he was still 1-1.5 seconds per lap slower than the leaders. That's a lot of time to give up and still hope to find a win. Jason Weigandt: I don't think the Triple Crown format will change up the 250 results much. The previous 2019 race winners— Nichols and Cianciarulo—are plenty capable in this format (by the way, they led every lap of their wins, see my answer above). The only bonus I could see is one of the young riders looking for a breakthrough—Mosiman, Cantrell, or McAdoo—maybe getting a good start and a good finish and grabbing some confidence. Steve Matthes: There's only one rider that could take a surprise win with Malcolm Stewart out. Ladies and gentleman, this is Justin Hill's dream race. Like the Fox Dream On campaign, they should just put Hill dreamily looking at a poster of "A2 TRIPLE CROWN." He's the obvious choice for sure. Can't wait. Jason Thomas: The 450 is much more likely to see a surprise winner, at least for one of the individual races. Justin Brayton and Cole Seely have both won in the past and have to be considered. I think Justin Hill is very much in this conversation, Mookie would have been barring his injury, Dean Wilson would have won one if A1 was a Triple Crown, and Chad Reed's heat race burst last weekend puts him into the discussion. 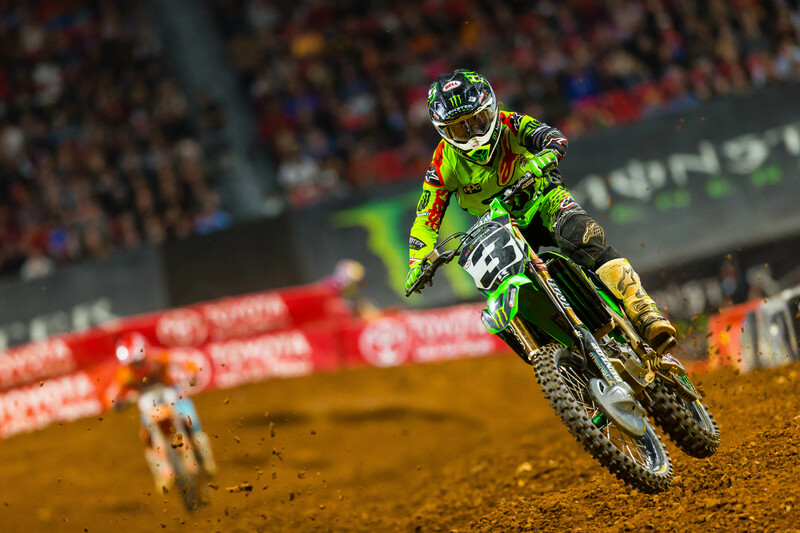 While Matthes has a great case for Justin Hill, when I look at the variables and then who has been getting the starts, I will take Justin Brayton to repeat last year's performances. He was the heat race winner in Glendale and seems to excel in these formats. Jason Weigandt: Chad Reed is in the opportunist stage of his career. He's not going to reel off 17 podiums in 17 rounds anymore, but he knows how to seize the moment. If Chad gets a start in one of these races, he will fight like hell to hold on, and use all of his race craft to get the job done. And the fans will go nuts.